SimpleCart is an easy to use e-commerce solution with online payments, coupons and more for your MODX site. Who developed SimpleCart? What is its history? SimpleCart was originally developed years ago by Bert Oost from OostDesign. On June 4th, 2015, Bert announced he was looking to hand over SimpleCart to another party as he could no longer dedicated the time to it. At that point, modmore stepped in and officially took over the code and infrastructure on June 8th, 2015. Since then, billing and licensing have been moved over to the modmore.com systems to ensure a consistent experience and modmore will maintain the package. I had licenses before SimpleCart was adopted by modmore. How can I update? Welcome back! Please visit the Migrate Licenses page for more information about how to reclaim your licenses and updating existing sites. What does the one year of support include? Basically, you get to send us emails, and we reply. :) We typically respond within 24 hours at most, but in some cases we might need some more time to really get to the bottom of your SimpleCart questions, so it might take a bit longer. Through our email support, we can provide you with answers to questions about what features are supported, how they work, setting up SimpleCart, how you might extend or influence certain features, how you can add and mix certain MODX and SimpleCart-related features and of course bug reports and feature requests. The included support does not cover front-end or custom development (e.g. how to style your cart) with SimpleCart. For these and similar queries, it it possible to request a consult or a custom development quote. Is SimpleCart an out-of-the-box solution like Shopify? 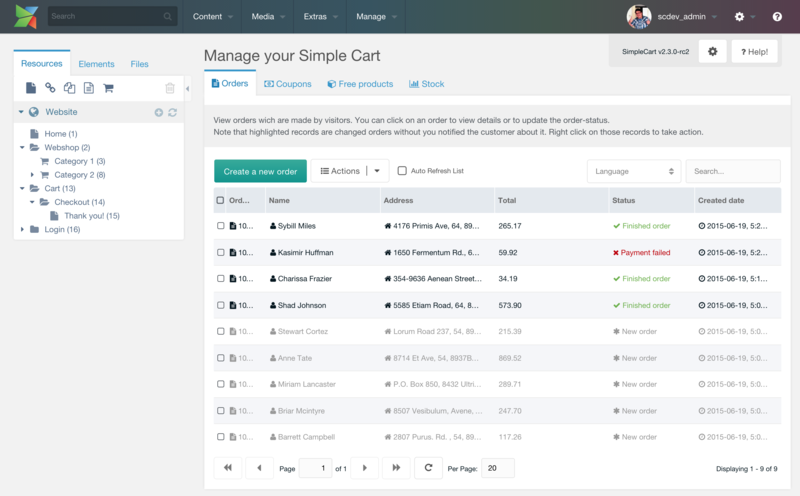 SimpleCart provides you with a blank slate for you to implement your shop. It provides the functions you need, such as a cart, product options and discounts, but you'll need to build the shop yourself. Just like MODX itself! Do I need separate licenses for development or staging environments? Originally SimpleCart offered up to three domains per license. As of the move to modmore however you can only have one domain per license. If you need an extra license for your development or staging environment, please contact [email protected] to get one extra license per purchase assigned to your account. Alternatively the Unlimited License Subscription can be an interesting offer to get an infinite number of licenses, for the simple price of one license per month. Which payment methods does SimpleCart support? See the list of available payment methods here. Can SimpleCart be used for Subscriptions? Sorry, SimpleCart is only really suited for one-off orders. We do try to eat our own dogfood as much as possible, but in this case modmore.com already used a billing engine built specifically for our requirements for two years before we adopted SimpleCart. The former SimpleCart website did run on SimpleCart itself, but as we've moved licensing to modmore that is no longer actively in use. Does SimpleCart handle registration and login during checkout? SimpleCart doesn't handle logging in, or creating accounts, but if a customer is logged in when they checkout SimpleCart will assign the order to that account. To restrict checkout to logged-in customers, you can use the Login extra for login and register, and restrict the manager access to checkout page using a resource group and the proper access control lists. Is it possible to change the status a new order gets? Yes, by default orders will go into the finished status, but that can be changed by adding a new system setting. This setting is not created on install, so you'll need to create it manually. The setting to create is simplecart.finished_order_status. For other statuses you can use the same structure, for example simplecart.new_order_status to change the status of a freshly created order before it is marked as paid/finished. The value of the setting needs to be the name of an existing status. Statuses can be viewed and created under Extras > SimpleCart > Order statuses. My delivery/shipping address is getting doubled up, like "NameName". What's wrong? SimpleCart automatically matches posted values to the address fields. If you're seeing a delivery address getting duplicated values, that is likely the result of an incorrect (implicit) matching. Basically, SimpleCart will see a name or address field it recognises, and add it to both addresses. To remedy this problem, use the order_ prefix on your order/billing address fields, and the shipping_ prefix on the delivery address fields.